Up to $600 WEEKLY with new 5 min. photo equipment. No experience necessary. Write: FEDERAL IDENTIFICATION Dept. K 1012 N.W. 17 Oklahoma City, Okla. 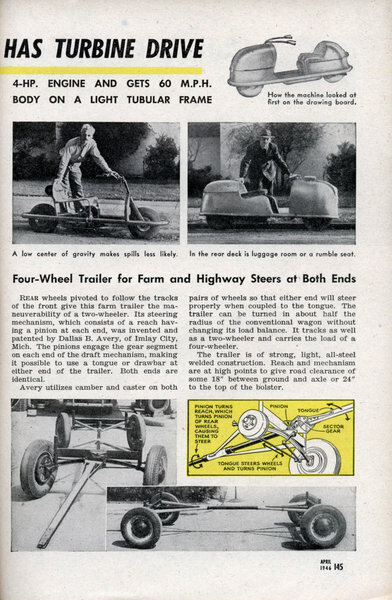 DESIGNER'S DREAM CYCLE USES A 4-HP. ENGINE AND GETS 60 M.P.H. 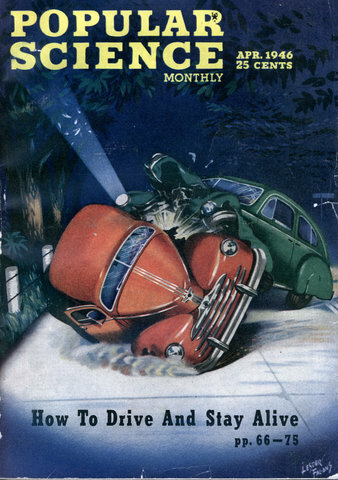 IT SPORTS A POLISHED ALUMINUM BODY ON A LIGHT TUBULAR FRAME. 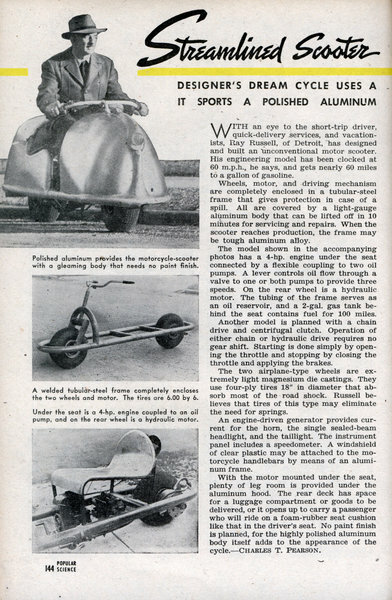 WITH an eye to the short-trip driver, quick-delivery services, and vacationists, Ray Russell, of Detroit, has designed and built an unconventional motor scooter. 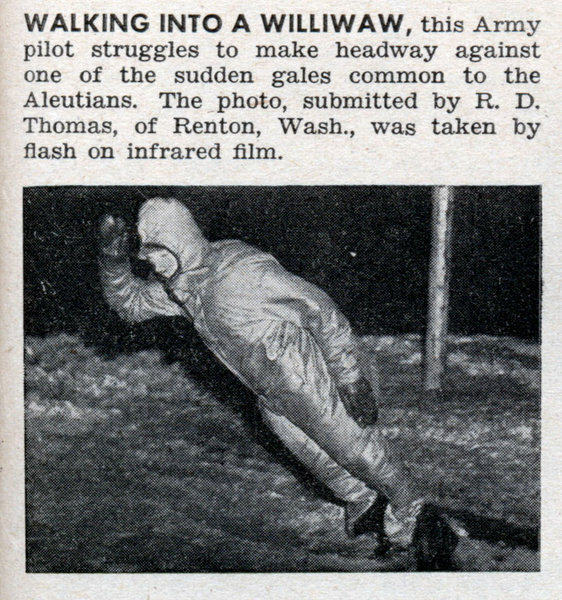 WALKING INTO A WILLIWAW This Army pilot struggles to make headway against one of the sudden gales common to the Aleutians. The photo, submitted by R. D. Thomas, of Renton, Wash., was taken by flash on infrared film. 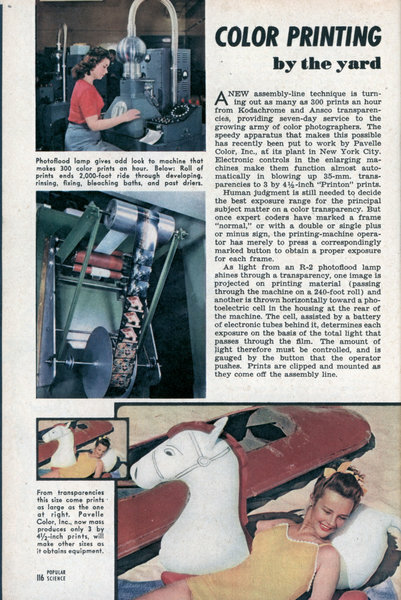 A NEW assembly-line technique is turning out as many as 300 prints an hour from Kodachrome and Ansco transparencies, providing seven-day service to the growing army of color photographers. 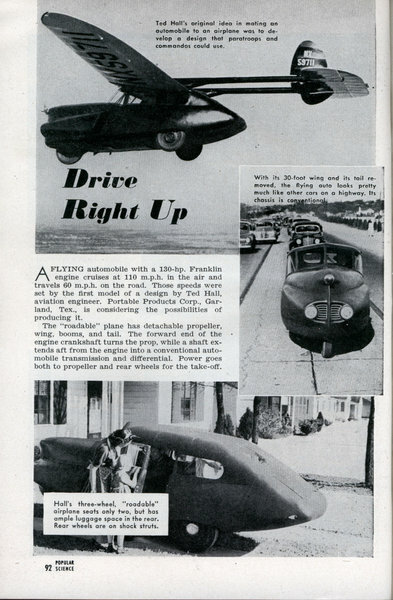 The speedy apparatus that makes this possible has recently been put to work by Pavelle Color, Inc., at its plant in New York City. Electronic controls in the enlarging machines make them function almost automatically in blowing up 35-mm. transparencies to 3 by 4-1/2-inch "Printon" prints. 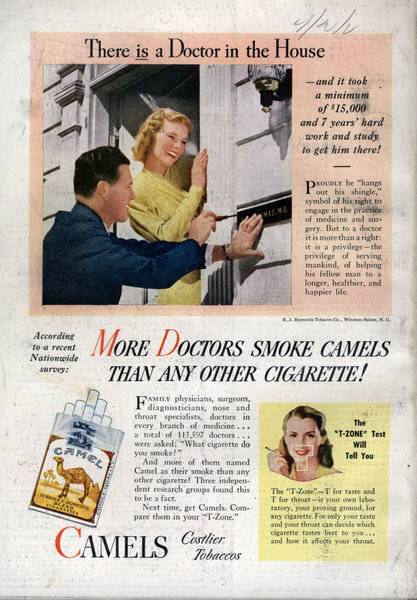 Ad: More Doctors Smoke Camels THAN ANY OTHER CIGARETTE! 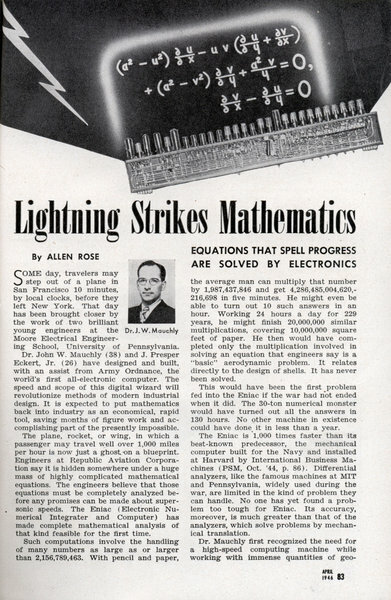 EQUATIONS THAT SPELL PROGRESS ARE SOLVED BY ELECTRONICS By ALLEN ROSE SOME day, travelers may step out of a plane in San Francisco 10 minutes, by local clocks, before they left New York. That day has been brought closer by the work of two brilliant young engineers at the Moore Electrical Engineering School, University of Pennsylvania. 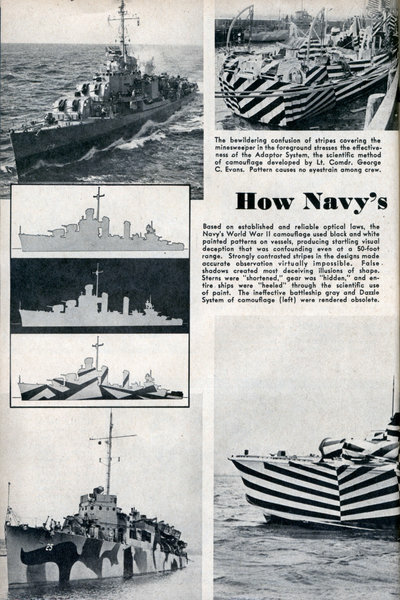 Dr. John W. Mauchly (38) and J. Presper Eckert, Jr. (26) have designed and built, with an assist from Army Ordnance, the world's first all-electronic computer. The speed and scope of this digital wizard will revolutionize methods of modern industrial design. It is expected to put mathematics back into industry as an economical, rapid tool, saving months of figure work and accomplishing part of the presently impossible. The plane, rocket, or wing, in which a passenger may travel well over 1,000 miles per hour is now just a ghost on a blueprint. Engineers at Republic Aviation Corporation say it is hidden somewhere under a huge mass of highly complicated mathematical equations. The engineers believe that those equations must be completely analyzed before any promises can be made about super-sonic speeds. 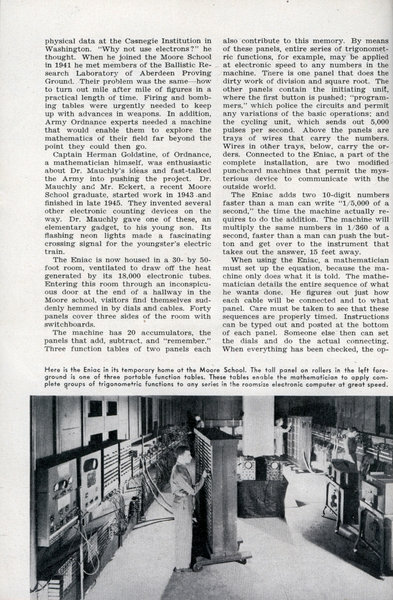 The Eniac (Electronic Numerical Integrater and Computer) has made complete mathematical analysis of that kind feasible for the first time. NEW commercial transport planes, shrinking the United States to 1/200 the size of a century ago in terms of time, are incorporating a brand-new concept of comfort for the passenger. 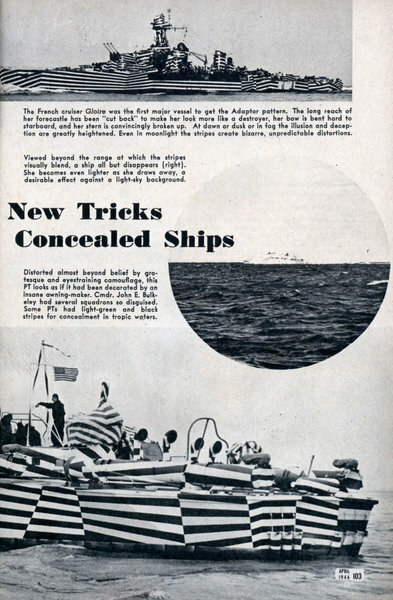 When airliners began operations in the late 1920s, the mechanics of operation were a primary consideration with designer and air-carrier companies. Today cushion-rubber chairs, modernistic lounges, and temperature controls are deemed as important as the navigational devices up front. 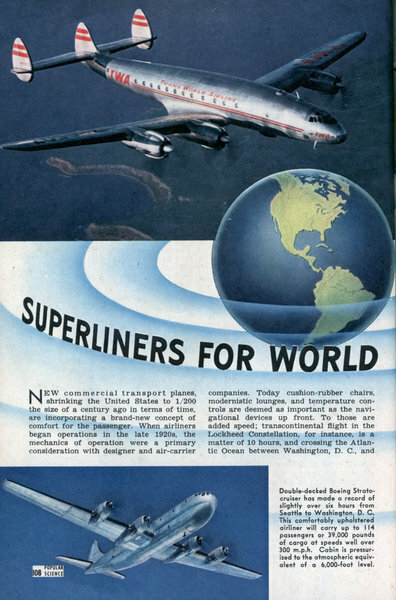 To those are added speed; transcontinental flight in the Lockheed Constellation, for instance, is a matter of 10 hours, and crossing the Atlantic Ocean between Washington, D. C, and Paris, France, takes less than 13 hours. 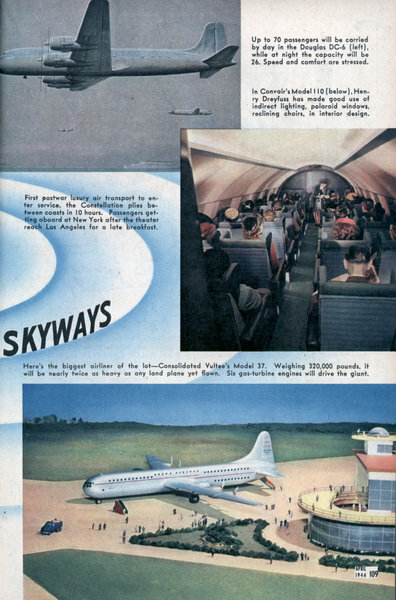 Designers and engineers are preparing other titans to speed the new era of air travelâ€”Douglas' DC-6, the huge Strato-cruiser by Boeing, and the gigantic Model 37, by Consolidated Vultee. Soon a passenger may breakfast in London, enjoy a late lunch in New York, and go to bed that evening in Los Angeles. 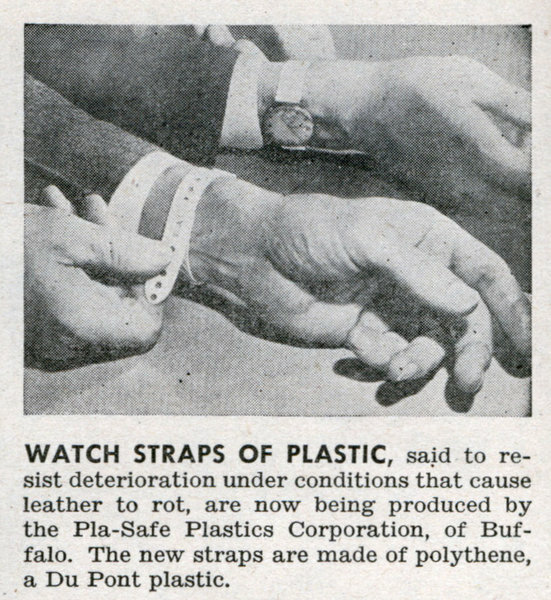 WATCH STRAPS OF PLASTIC, said to resist deterioration under conditions that cause leather to rot, are now being produced by the Pla-Safe Plastics Corporation, of Buffalo. The new straps are made of polythene, a Du Pont plastic. 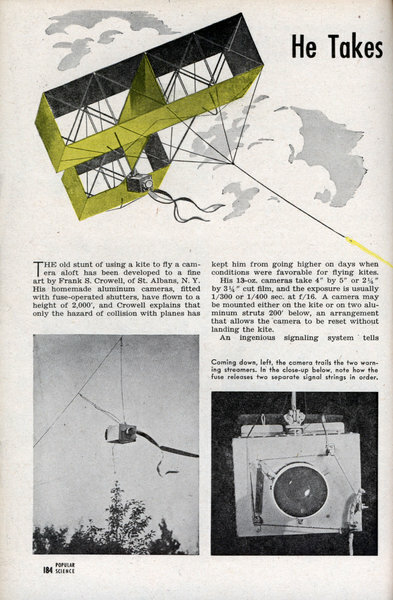 THE old stunt of using a kite to fly a camera aloft has been developed to a fine art by Frank S. Crowell, of St. Albans, N. Y. 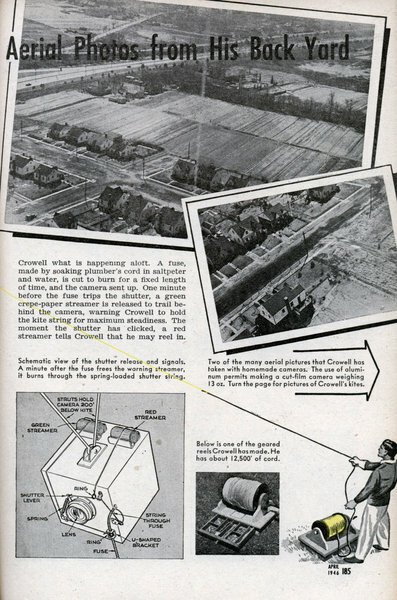 His homemade aluminum cameras, fitted with fuse-operated shutters, have flown to a height of 2,000', and Crowell explains that only the hazard of collision with planes has kept him from going higher on days when conditions were favorable for flying kites. 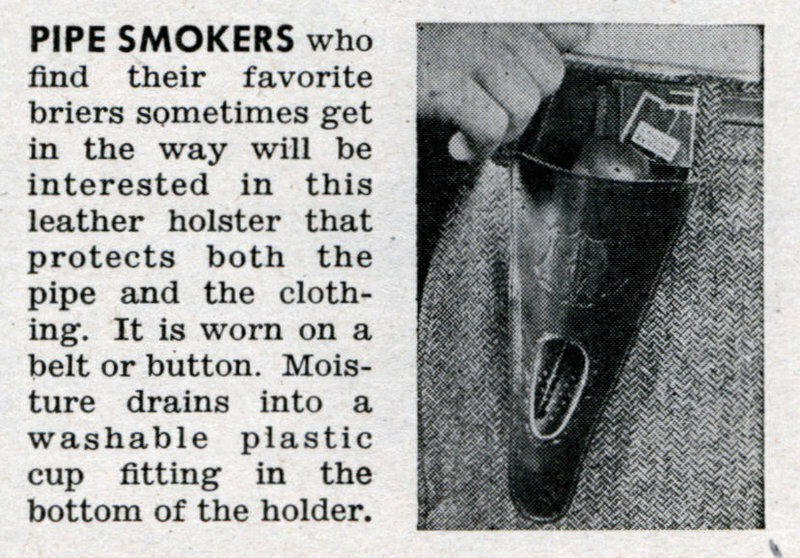 PIPE SMOKERS who find their favorite briers sometimes get in the way will be interested in this leather holster that protects both the pipe and the clothing. It is worn on a belt or button. Moisture drains into a washable plastic cup fitting in the bottom of the holder. 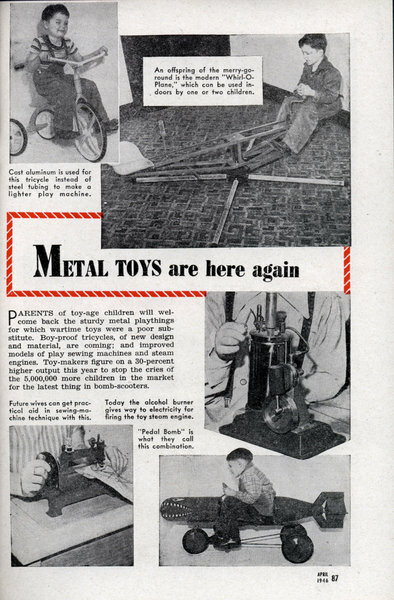 War gear of "Frog Men" will create new sport, save lives By HARRY SHERSHOW OUT of the wealth of atom bombs, flame throwers, booby traps, and other World War II inventions, have come some devices that promise to survive and become indispensable in peace. 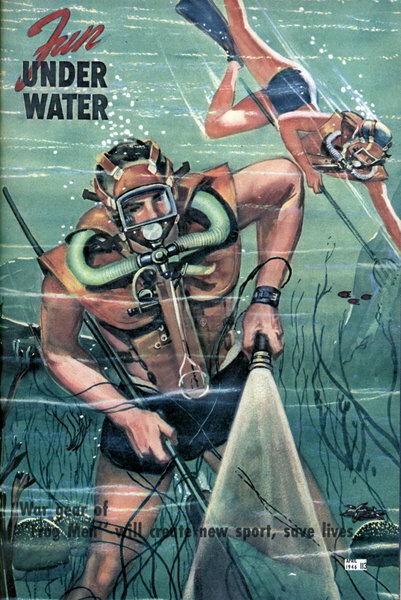 Among them are oxygen-charged respiratory units, perfected for the Army and Navy for underwater offensives against the enemy. Like DDT and the jeep, these breathing machines will be of service to anyone who learns to use them. 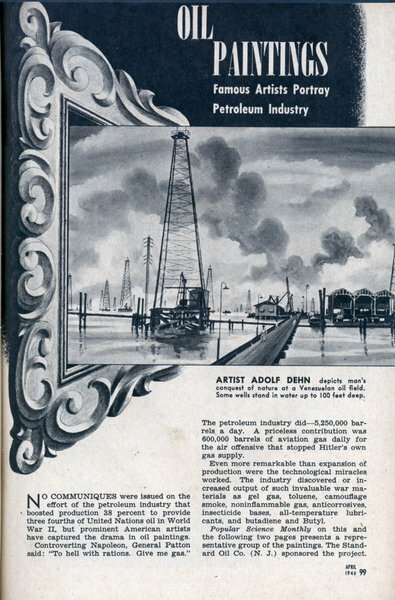 NO COMMUNIQUES were issued on the effort of the petroleum industry that boosted production 38 percent to provide three fourths of United Nations oil in World War II but prominent American artists have captured the drama in oil paintings.